Delta Phi Epsilon hosted various events on campus last week to raise awareness and show support for ANAD (The National Association of Anorexia Nervosa and Associated Disorders). According to anad.org, ANAD organizes programming for its yearly Eating Disorder Awareness Week (EDAW) in order to promote greater awareness, education, understanding and compassion for people suffering from an eating disorder. DPhiE hosted five days of activities for students to participate in. 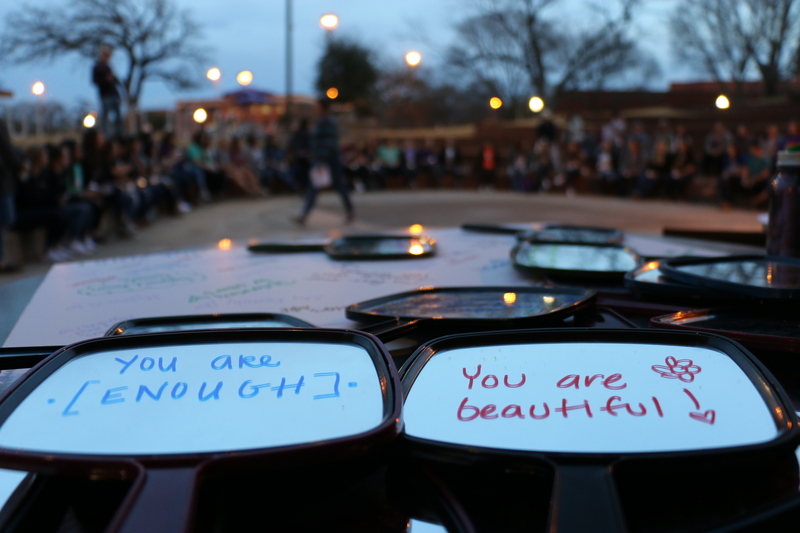 The first event of the week was called Mirrorless Monday and members of DPhiE handed out positive notes so students could write something positive on a sticky note and stick it on the mirror. The second event was called Treat Yourself Tuesday and DPhiE members sold treats at a table in front of the Tarleton State University dining hall. Wednesday’s event was called Wellness Wednesday and DPhiE encouraged students to go out and do something healthy for themselves. They came up with five different group exercise classes for the event. Trash Your Insecurities Thursday was next, and students could write something they didn’t like about themselves on a sticky note and throw it in the trash can. The event on Friday was called Selfies for ANAD and students could send a selfie and hashtag it with eight or nine different hashtags to be entered into a contest to win a gift card or other donations. Cristina Neely, vice president of programming for DPhiE, said that the inspiration for creating ANAD at Tarleton is to have a lasting impression. “We wanted to be able to have as many days as possible to reach as many people on campus and in the community as we could. Other chapters do really similar days, but we wanted to expand it to other parts of our campus community because that’s one of the things that we value about ourselves is being unique, so we wanted to promote to other people to embrace that,” Neely said. 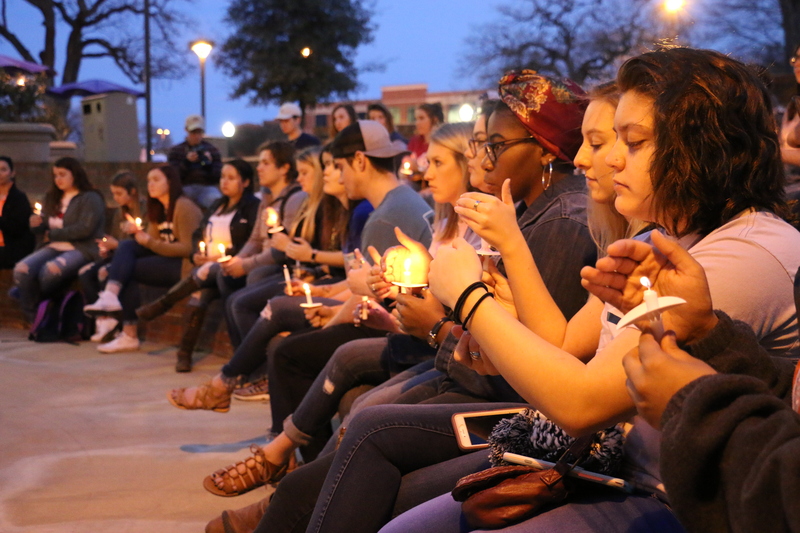 ANAD week ended with a candlelight vigil on Friday night to honor those who have struggled with eating disorders along with the ones who have lost their lives. Students gathered around the Tarleton amphitheater around 6:00 p.m. to show their support for those struggling with these disorders. After all the candles were lit, a moment of silence was held for those who have suffered and those who continue to suffer from these disorders. Neely said the purpose of these events throughout the week is to raise awareness. “Around 24 million people in the United States suffer from an eating disorder and a large majority of them are college students so [the purpose of these events is] to bring awareness to eating disorders because you never know what the person sitting next to you might be suffering from and, in turn, you never know how far a compliment can go for somebody,” she said. Neely said what she wants students to take away from these events is that beauty is not always on the outside. “I’m hoping [students] will take away from [the events that] it’s not always about what you see. Beauty definitely isn’t skin deep and that’s something we really value in our sisterhood and in our sisters as well as in other people. That’s what we encourage our sisters to look for in other people is (a) beauty that’s not always skin deep and to love yourself of course. It’s not about the number on the scale,” Neely said.